The Dar Boston 3 light semi flush ceiling fitting in an antique brass finish, with a detailed ceiling plate and three curved upward facing arms, ribbed detail shade carriers and supplied with opaque glass shades. Part of a traditional lighting suite particularly suited to rooms with a lower ceiling. 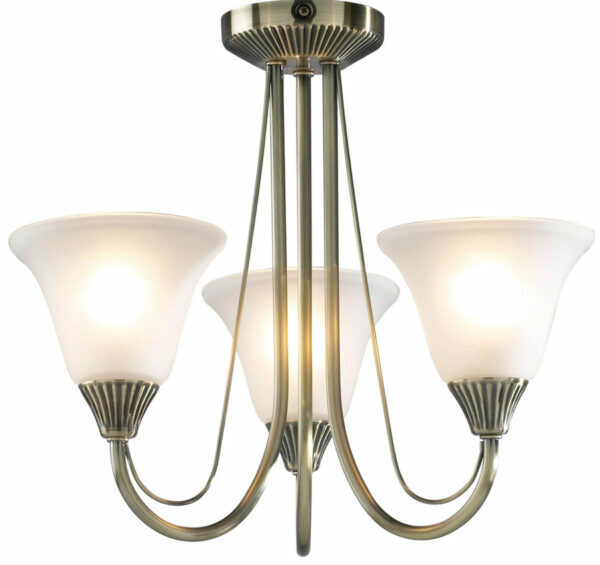 Part of the traditional Boston lighting range, which includes a larger five-light semi-flush fitting, a single and double wall light and floor and table lamps that can be viewed below.